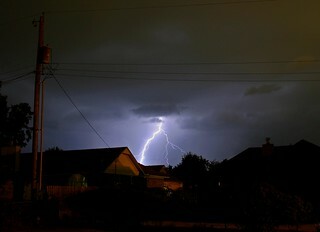 Around 5 am yesterday, we were awakened by the rumbling of an overdue thunderstorm. Within a few minutes, a tremendous light-sound explosion jolted us (psychologically, not electrically). My 1984 vintage clock radio came on by itself. The off button didn’t work. After I unplugged and replugged, it worked normally. My wife decided to calm down by watching the 1989 tube TV in our bedroom. The color was way off, a downward-pointing V-shape of purple over a field of green, overlaid on the picture. I later verified that the TV was the culprit, not the Apex digital tuner, since it looked the same with the Roku box as input. Pretty odd that a 31-year-old radio could need a reboot. I thought one that old either worked or not. And it looked as though the TV needed a degaussing to demagnetize the tube. The picture was a bit fuzzy before (I had planned to replace it soon), but it didn’t have a color problem. Next, when I flipped the light switch in the bathroom, there was an audible pop like a static discharge. The light did come on normally. That got me worried about the computers, even though all the media room devices were on a power strip with surge protection for both AC power and the cable input. Likewise, the office/computer room devices were all on surge protection. Had a power surge toasted them? No, three Windows PCs appeared to be undisturbed. I figured the Raspberry Pi would be fried (ha ha), since it has been sensitive to power interruptions in the past. No, all its lights were still on. I next tried to remotely log into the monitor-less media room Windows PC. I failed due to a toasted Powerline adapter, which normally brings network access to the media room via house AC wiring. It was feebly blinking and wouldn’t reset. It was not surge protected, as it needs to be plugged directly into the AC socket. First significant casualty: the 2002 Denon media room receiver. The on/off switch did nothing. After an unplug/replug, it appeared normal and responded to the remote, but there was no sound whatever. This, despite surge protection. Later in the day, I reset its microprocessor, but still no sound, and when it scanned for FM stations, it found none with its previously adequate short wire antenna. Not promising. Later, I tested the speakers, and they were OK. But I wasn’t able to stream from the internet to the den, because in the office, the Linksys modem was dark, though the separate Linksys router was still working. The modem wouldn’t boot up even with a different power module. Ugh. My first priority would be to replace it. Also, there was no home phone service, since our Ooma Telo is internet-based. Miscellaneous damage: an X10 lamp module, a Roku 3 in the media room, and as I learned later, a wireless phone/answering machine. Also, the garage door opener motor! Finally, a microwave and the oven were the lone devices in the house to lose their time setting. OK, it wasn’t really this bad. Was it an electrical surge conducted through the wiring, or more exotically, a burst of electromagnetic radiation inducing current in the devices, or both? I may never know. Lightning is freakish. But the results were nuclear, despite surge protection. This is the first time I’ve lost electronics from a lightning strike. I’ll talk about what I was able to recover during the day (quite a bit) in the next post.